I love pasta of any description as long as it is cooked properly. There is nothing worse than a mushy bowl of pasta, and no matter how wonderful the sauce may be, if you’ve overcooked the pasta you’ve spoiled the dish. Although I love making fresh pasta at home and stuffing it, or layering it in a delectable lasagna dish, some of these pasta dishes are a little labor intensive and best left for days when you’ve got a lot of time in the kitchen. There is now a huge selection of good quality dried pasta sold at almost any store that can be used to create a delicious, fast meal on those busy weeknights when you have little time for meal preparation. The wonderful thing about pasta is that you can consider pasta as “fast food” as there are many pasta dishes that can be prepared from start to finish in under thirty minutes such as this tasty one made with roasted red peppers. I usually have a container of roasted peppers in my refrigerator, but if you are not so lucky, feel free to buy a jar of roasted peppers to create this dish, which will help reduce your prep time considerably. I add a little heat to this dish by adding in a red chili pepper, but feel free to eliminate this if you are making the dish for children. The sauce is perfect all by itself, but I topped our pasta with goat cheese crumbles and toasted, chopped walnuts. 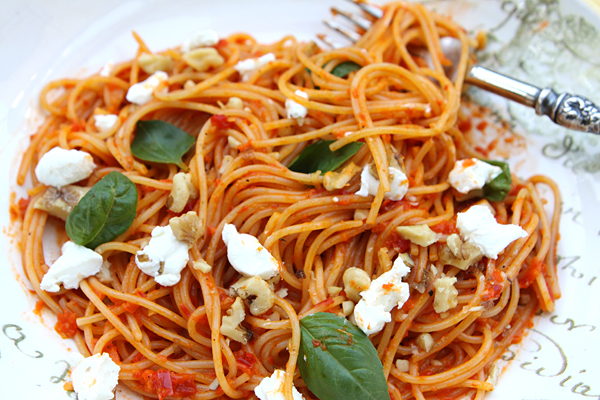 You can stir the goat cheese into the hot pasta before eating creating a really delicious creamy sauce. 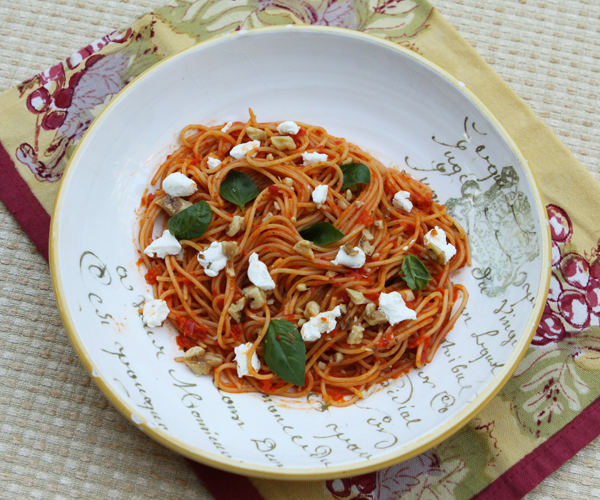 We used Trader Joe’s High Fiber Spaghetti for this dish, although I also like Barilla Plus brand as well. High fiber pasta is a great source of dietary fiber. Walnuts are rich in fiber, B vitamins, magnesium, and antioxidants such as Vitamin E, and are also high in plant sterols and fat (omega 3 fatty acids, in particular, alpha-linolenic acid ALA) that have been shown to lower LDL cholesterol. Roasted peppers are used to make a creamy sauce for this tasty pasta dish. Heat the olive oil and cook the onion until tender, about 5 minutes. Place the onions, garlic, peppers, tomato paste and chicken broth in a food processor and blend until smooth. Season with salt and pepper, then transfer to a pot and keep warm. Cook the pasta in a large pot of boiling salted water, until "al dente". Return the pasta to the pot, add the pepper sauce and stir over high heat until well mixed, adding some of the pasta water as needed to loosen the sauce. Serve the pasta in individual bowls, topped with the goat cheese crumbles and walnuts.